Mitt Romney continues to be the clear top choice of Republicans in Nevada to be their Presidential nominee. But Rick Perry's moved into second place in the state and when you dig deeper into the numbers there are signs of potential trouble ahead for Romney. Romney's at 31% to 18% for Perry, 14% for Michele Bachmann, 11% for Ron Paul, 8% for Herman Cain and Newt Gingrich, 2% for Jon Huntsman, and 1% for Tim Pawlenty. Here's what should worry Romney: he has 88% name recognition. With the voters who have an opinion about him, positive or negative, his lead expands a little bit to 34-17. Perry, however, has only 60% name recognition. And with those voters who are familiar with him he actually leads Romney 29-23. That suggests Perry could overtake Romney if he gets into the race and achieves parity in name recognition- voters who know both prefer Perry. For now though Romney does have the lead in Nevada. Some folks are inclined to write off his strength in the Silver State as a function of the large Mormon presence in the state. That doesn't tell the whole story though- Romney does lead Perry 64-11 with Mormons but they only account for 13% of the Republican primary voters we polled. He leads Perry 26-19 with non-Mormons as well. So you can credit 6 points of his lead- about half of it- to the Mormon vote but his appeal extends beyond that. -Huntsman polls at only 2% even though he served as Governor in the state next door and even though the state has a decent sized Mormon population. This guy isn't getting any traction anywhere. -When we polled Nevada in April Pawlenty was at anywhere from 7-10% in the various iterations of the field that we tested. Now he's all the way down at 1%. Clearly whatever support he was showing then was quite soft and has dissipated as other candidates- Perry, Bachmann, even Cain- have proved to be more compelling to the GOP electorate. I think there's a general perception nationally that Pawlenty is failing to gain support but in Nevada he's actively losing it. -Newt Gingrich barely seems worth talking about anymore but on our last Nevada poll he was polling at 21% in the version of the field that didn't include Palin, Mike Huckabee, or Donald Trump. Now he's at 8%. Gingrich still looked like a viable candidate in April before his May implosion and these numbers are a good measure of just how far his support has fallen. We also looked at a version of the Republican field that included Sarah Palin. In that one Romney still leads Perry 31-18, with Bachmann and Palin at 10%. Bottom line: Romney is still the favorite in Nevada but it looks like things could get a little bit more interesting than they were last time around when Romney romped in the state. Where is your study data and you fail to mention why Ron Paul is left of the statistical break down. What are you numbers with declared candidates? He's at 11%. It's right there in the article. Read a little closer. But he IS left off the statistical breakdown. It shows the favorables/unfavorables for several candidates, a few of which Paul is beating. Also, why is Paul still being left off heads-up polls with Obama in favor of Pawlenty...? The voters are who will bring this country down. Look at what uninformed voters have gotten us already, 2 unpaid for wars, huge deficits mostly caused by Republicans,spending cuts for us,and tax cuts for the top 1%, in a time we need more job creation for Infrastructure projects.During the same time Republican Governors are cutting out jobs for our teachers, police & fire depts. GOP huge tax breaks for the top 1%.We lost for the first time in history Americas AAA bond rating! America its up to you to know that if Republicans get control of all three branches of government, Social Security & Medicare will be history too! The Democrats are not perfect, but they at least cared enough about average hard working Americans to give us the 40 hour work week the minimum wage & child labor laws, and the chance to retire with a little dignity with Social Security & medicare ! What party is most likely to protect and preserve these programs we all have paid into and most of us rely on ? The political party that inacted them (DEMOCRATS) or the political party that wants them gone, The (REPUBLICANS) ? Its a clear choice for me because I care about working class Americans, how about you? This is a poll of Nevada primary voters, but Nevada is a caucus state. Mormons turned out disproportionally to caucus in 2008 to support Romney, earning him 51% of caucus vote when he wasn't polling nearly that high. "This is a poll of Nevada primary voters, but Nevada is a caucus state." Right, but it's hard at this point to get a sense of who will show up to caucus, so we just use our usual primary screening question. 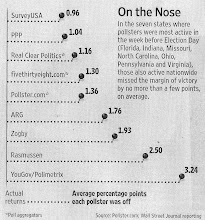 Same as in IA, and same as us polling registered voters for the general election rather than LV. "Also, why is Paul still being left off heads-up polls with Obama in favor of Pawlenty...?" We poll the top 5 candidates in our national poll. We're no longer polling Pawlenty against Obama, and have replaced him with Perry. That's been the case for a few weeks, including on this poll. Pay attention.